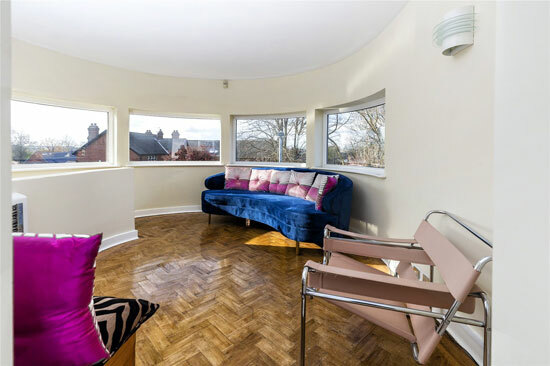 It might look familiar as this 1930s Blenkinsopp and Scratchard art deco property in Castleford, Yorkshire has been offered for sale in years past. 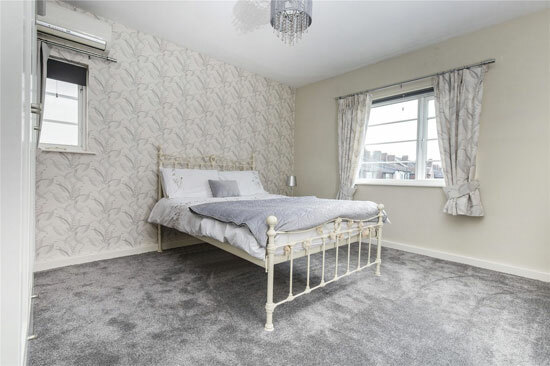 Specifically, this house was on the market back in 2012 and in 2017 and on both occasions proved incredibly popular on the site. 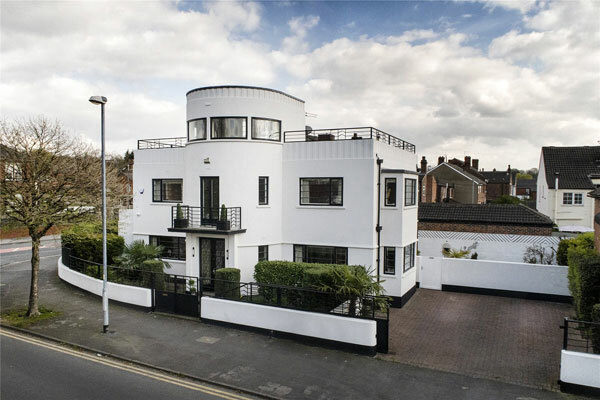 In fact, this house made the cut in my top 30 most popular art deco finds on the WowHaus site, coming in at number 9 on that list. 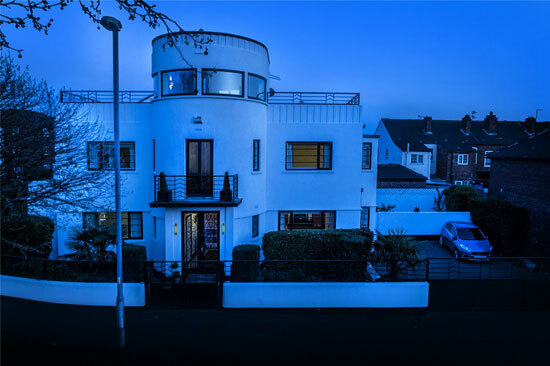 That’s because this is pretty much the dream when it comes to art deco architecture. All the details and perfectly preserved and/or renovated. 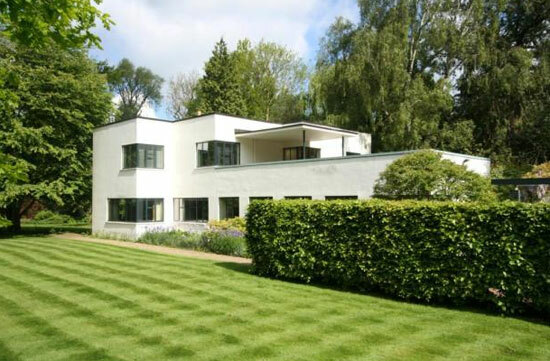 A striking house and for less money than you might think. The latter is because of its location. 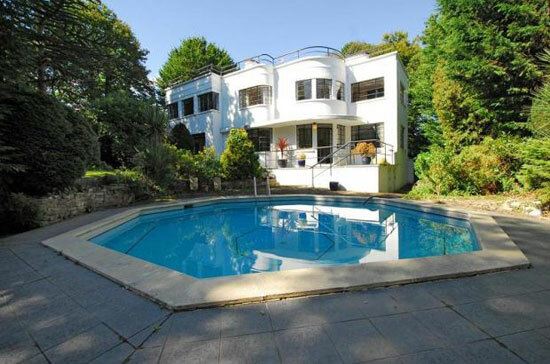 If this house was in a desirable part of the home counties or in London it would be up for a ridiculous sun. 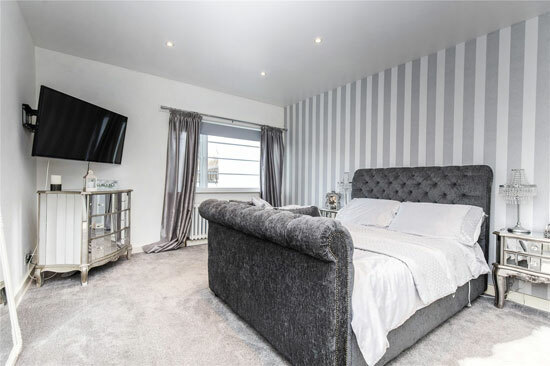 But this house is up for sale in Castleford, West Yorkshire. That’s not a criticism of the town. I’m just pointing out that it is for sale in a cheaper part of the country. 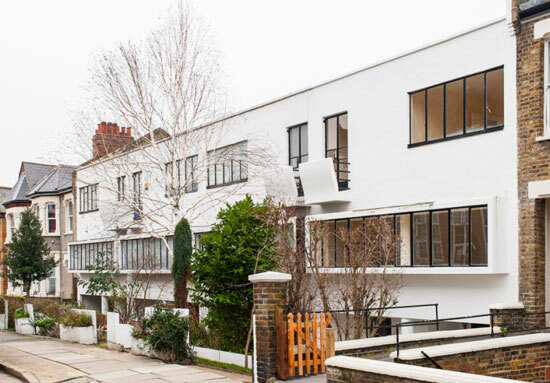 It dates back to 1934, a Blenkinsopp and Scratchard design, it was originally used as both a home and surgery for Dr Innes Pragnell and stayed with that dual use until the 1950s. After that, it reverted to solely domestic use. 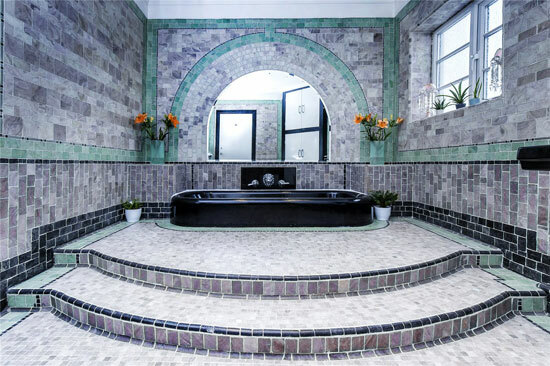 The surprising thing with this house is the number of period details that are still in place. 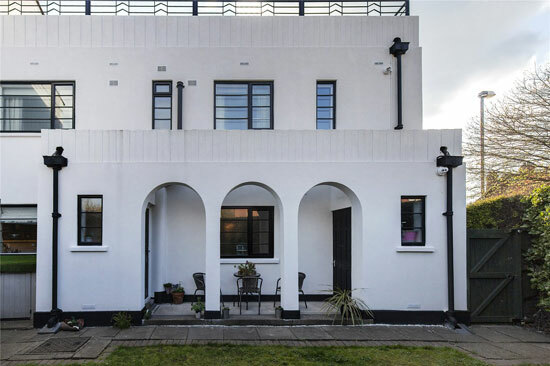 No one is pretending this is some kind of 1930s time capsule, but it does have more originality than your average art deco house on the market. 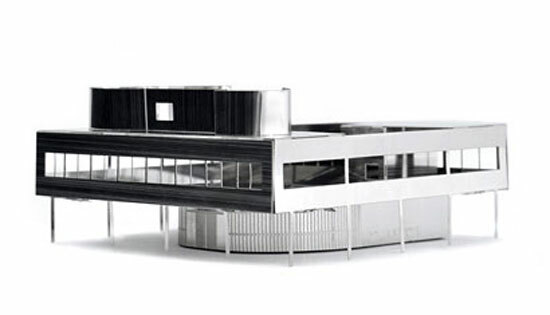 The architecture has certainly been looked after over the decades. 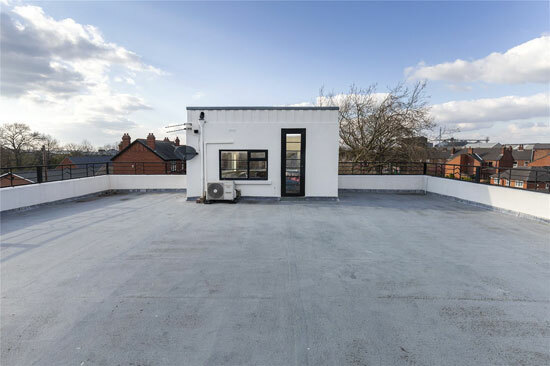 The angles and the curves, the central tower, the balcony and of course, the roof terrace. This is a building you really cannot take your eyes off. I don’t know if those railings are original or a modern interpretation, but in black, they really do add a wonderful finishing touch. Likewise the windows in this place. But a house isn’t just an exterior. It needs a strong interior too. With this one, it’s more of a mixed bag. 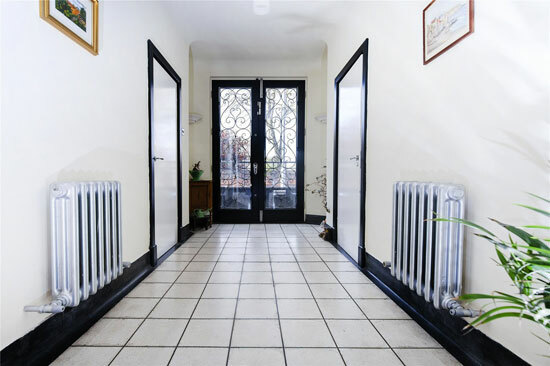 There are original details still in place and little seems to have changed since the house was last on the market, with the exception of some of the decor and the furnishings. The originality that was first spotted back in 2012 is still in place now. 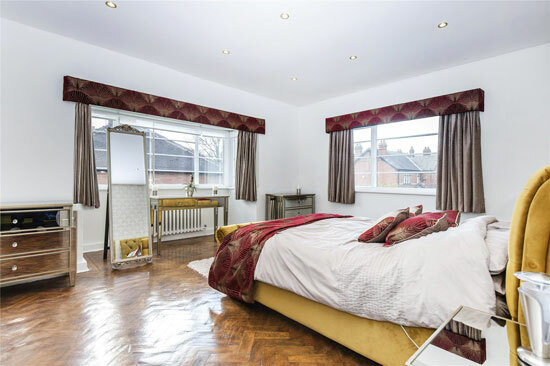 On that front, I am talking about details like a number of the internal doors (and door handles), parquet flooring, the curved hallway, that amazing bath and of course, the roof terrace space. But the modern era is also a key part of the interior too. 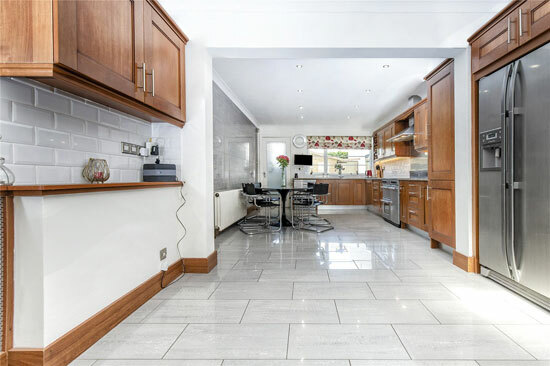 A wander through this place shows a large and modern kitchen area, an updated second bathroom and plenty of modern-era decoration. 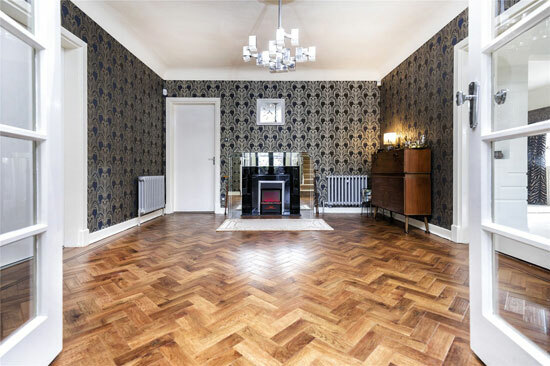 As I said, this is no time capsule, but take away the bold wallpaper, add in a more era-neutral kitchen and update the furnishings and you won’t be too far away from the original era. 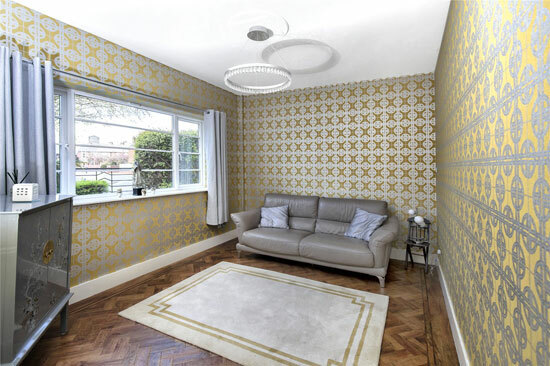 As ever, it’s all down to personal taste when it comes to an interior and that is something you can change fairly easily. Space is also a selling point in this house. Basically, there is quite a lot of it. 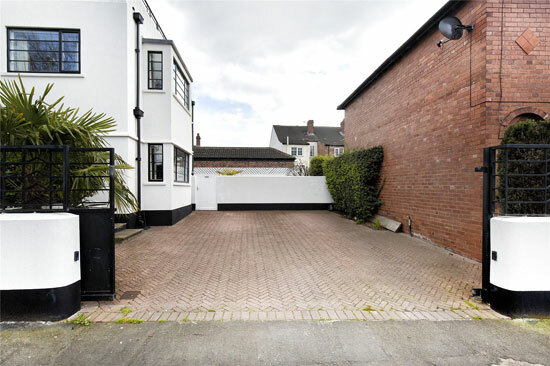 Hardly surprising with this being a former house and workspace. 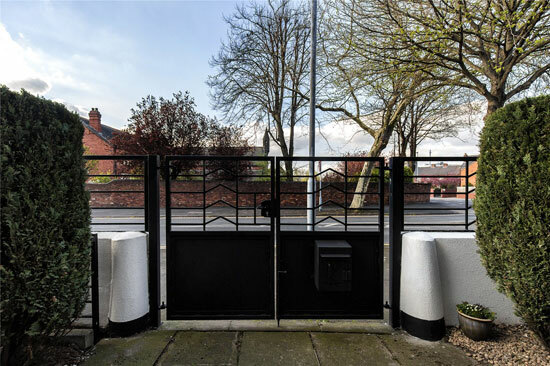 A ‘spacious’ vestibule kicks things off, complete with wrought iron double glazed French doors with the original decorative wrought iron inserts. 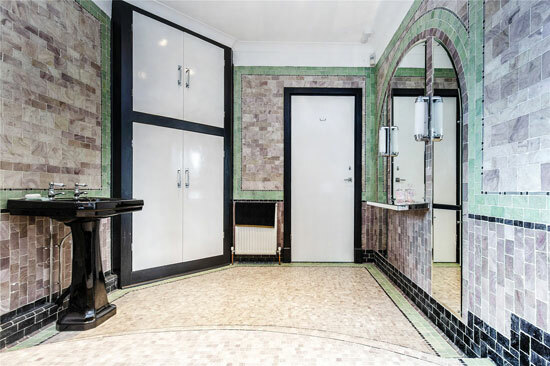 Also here are the original terrazzo floor tiles, two cast iron central heating radiators and doors to a storage cupboard and WC. 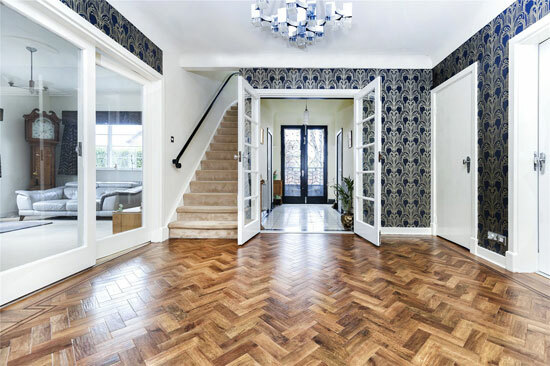 Double glazed doors lead into the reception room with parquet flooring, a sitting room, again with parquet flooring and modern-era family bathroom. 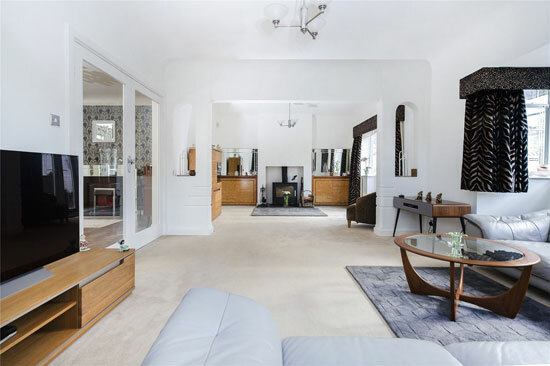 A lounge space is open-plan to the sitting room, complete with wood burner, four cast iron radiators and a swinging door to the dining kitchen. 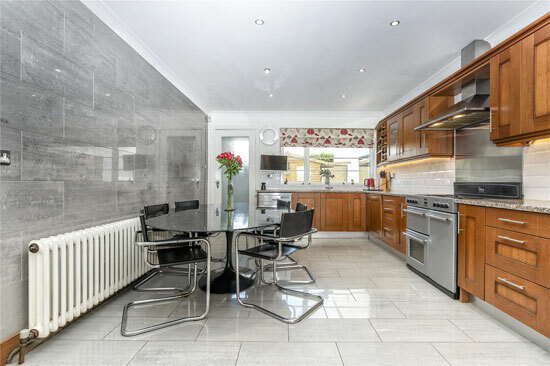 That kitchen area looks substantial, but is a very modern area, with no obvious period details still in place. I suspect the original kitchen was small and this is a fairly recent space replacing it. The kitchen also has doors to the side porch and boiler room. 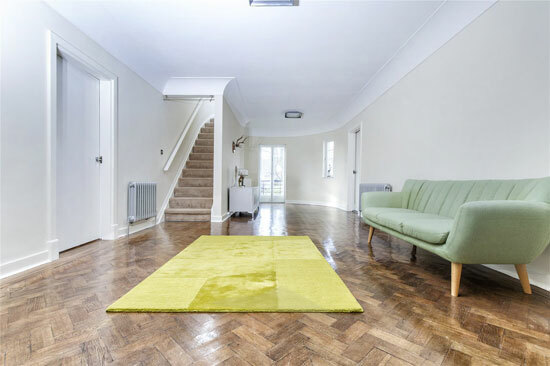 Head upstairs and the landing has more of that parquet flooring and more cast iron radiators, with double glazed timber French doors accessing the balcony. 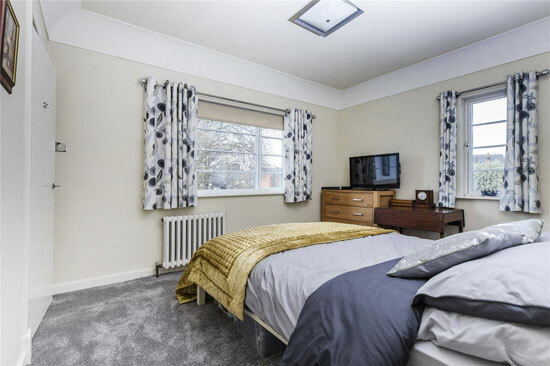 Beyond that is the first bedroom with fitted wardrobes, a second double bedroom with parquet flooring, a third double bedroom with access to the dressing room and a fourth bedroom with windows to the side and rear. 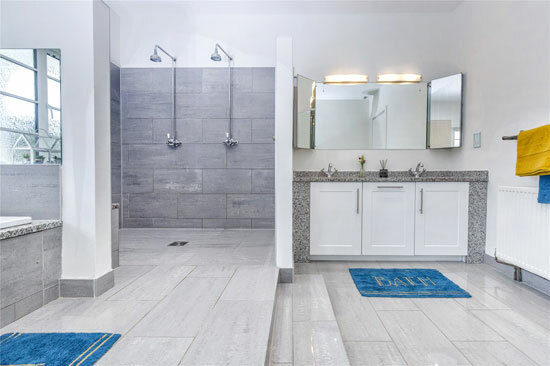 Of course, the bathroom is the star of the show up here, made up of an individual and original painted stone sunken bath with mixer tap plus mosaic tiling to the walls and floors and feature mirrors. That’s a statement room. 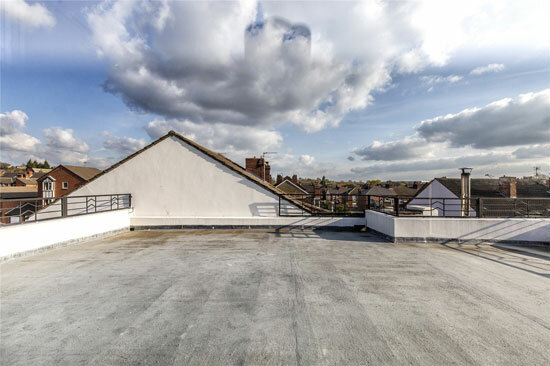 Finishing things off is a WC, the tower room, which offers panoramic views over the town and the roof terrace. 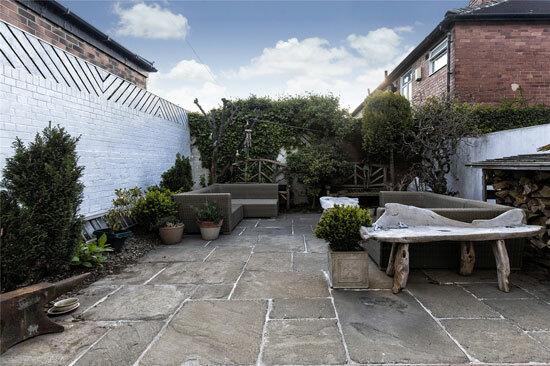 Outside space, beyond the top terrace, includes a paved driveway for parking, a lawned and seated area plus a courtyard-style garden with seating area. There’s also an outside WC if someone is caught short during an outside gathering. The price hasn’t changed much since it was last on the market, with Chatelaine (yes, it does have a name) now up for £370,000. Images and details courtesy of Whitegates. For more details and to make an enquiry, please visit the website.